If a massacre happens in the middle of the jungle, and nobody’s there to see it, should it make a headline? 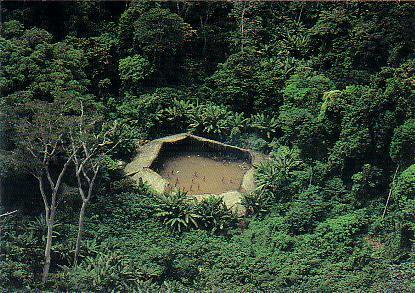 This is the troubling question we’ve all been having to wrestle over the last few days as we look at the strange story of the Apocalypse Now style massacre of up to 80 Amazonian indigenous people deep in the heart of the jungle, at the hand of helicopter-riding Brazilian illegal miners. The Venezuelan government – for reasons clear only to itself – rushed to announce the story was a hoax, even as indigenous organizations noted, in polite, extremely-careful-not-to-antagonize-the-powerful statements, that investigators dismissed their claims before actually visiting the site of the alleged massacre. Now, the word “remote” gets tossed around a lot in journalistic circles. But the Irotatheri Shabono (village) where the massacre allegedly took place must be one of the most inaccessible points on the planet: a miniscule speck of human settlement miles and miles from the nearest road, in the middle of the wilderness. Corroborating anything that happens that far from anything is impossible for non-state actors. There ain’t no cellphone towers in Irotatheri, and nobody has a Blackberry. In fact, it took the handful of survivors days walking in the jungle to get the news out. We will probably never know what really happened at Irotatheri Shabono. There were no witnesses, and even if there had been a proper investigation, by the time news of the event reached the outside world weeks had passed and evidence would’ve been badly degraded. You can’t get through a news bulletin in a first world country without eventually hearing some police or government spokesman say “we do not comment on ongoing investigations,” or words to that effect. I hate it when they do that. I want to find out what’s going on, the person on the screen clearly knows more about it than I do, but he won’t tell me. It’s infuriating! It never really made sense to me why they would be so obtuse about it…until the Chávez era came along. Chavistas never refrain from commenting on ongoing investigations. And that turns those investigations into charades. It was the same thing after Amuay, and with the same result: when official spokesmen start running their mouths before a proper investigation has been carried out, they box themselves in, ruling out whole swathes of potential truth before there’s been a chance to really find out. They leave their investigators in an impossible position: all of a sudden, there are certain things their investigation is not allowed to find out, because it would make liars out of their bosses. Now, let’s be clear: It may be that insufficient maintenance and worker inexperience really had nothing to do with the Amuay disaster. It may be that there was no Yanomami Massacre after all. But by announcing them as fact before looking at all the evidence, the government makes a mockery of the investigations that follow. Previous article“Sensation of Insecurity” Chronicles, ctd.